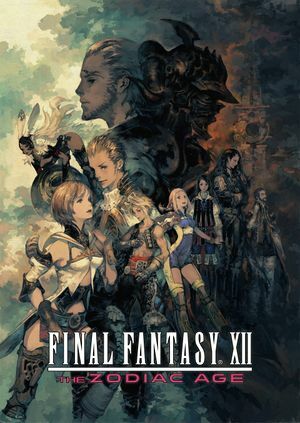 Based on the International Zodiac Job System version of Final Fantasy XII, which overhauled the original game's character-development system and added numerous quality-of-life improvements. Features support for 60 FPS gameplay, 21:9 aspect ratios, and multiple-monitor setups. Exclusive to the PC version are boosters which maximize LP and gil, as well as the ability to play both New Game Plus and Minus without having to first finish the regular game. Full Resolution Ambient Occlusion has a noticeable performance hit on AMD graphics card compared to Nvidia's offerings. The Day One Edition, available only during February 1-8, 2018, also includes three audio tracks, an exclusive wallpaper, and a 20% discount. The Collector's Edition is a version that comes with a download code for the game, a steelbook containing the game's soundtrack, a set of five Judge-themed busts, and six art cards. Unlocks framerate beyond 60 fps. Default FOV is 45°. 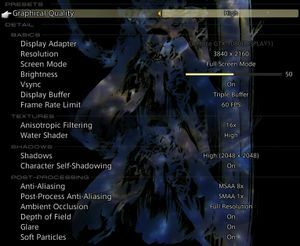 Use FFXIITZA-FPS-Unlocker. Choice of double or triple buffering. In-game 30 FPS or 60 FPS limiter. Keyboard settings. Some commands can be bound to up to three different keys, while others can only be bound to one. Six settings for both X/Y axis. Controlled with WASD/Arrows and Left/Right clicks by default. Optional config tool must be used with mouse. Can swap config/back buttons between A/B or X/O. Mouse sensitivity settings affect controller sensitivity. Changes dynamically as soon as input is detected. No vibration on DualShock 4. Music, sound effects and voice sliders. Game pauses when not focused. If it doesn't pause (e.g. some cutscenes), sound is not muted. Music can be toggled between the PS2 original in-game BGM, PS2 original soundtrack, and new re-orchestrated BGM. See Helix Mod: Final Fantasy XII The Zodiac Age. 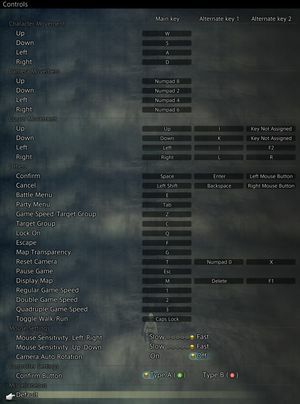 The game has an option to run at different speeds by pressing the F1-F3 keys. Press F1 to return to default speed. ↑ 1.0 1.1 File/folder structure within this directory reflects the path(s) listed for Windows and/or Steam game data (use Wine regedit to access Windows registry paths). Games with Steam Cloud support may store data in ~/.steam/steam/userdata/<user-id>/595520/ in addition to or instead of this directory. The app ID (595520) may differ in some cases. Treat backslashes as forward slashes. See the glossary page for details. "The PC version of the Product Software uses Sony DADC Austria AG’s Denuvo (“Denuvo”) content protection technology." ↑ FINAL FANTASY XII THE ZODIAC AGE is out on steam ! This page was last edited on 11 March 2019, at 03:41.